Onychomycosis is a fungal infection of the fingernails or toenails, which can be promoted by a variety of factors including family history, fitness activities, bathing in communal showers (gym, etc.) and more. 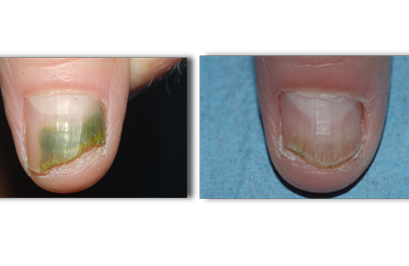 Nail fungus can become a significant cosmetic concern as it causes your nails to become discolored and disfigured. The Nordlys Nd:YAG laser can treat onychomycosis rapidly and effectively. ∗The Nordlys Nd:YAG laser emits infrared light, which is aimed at the whole nail, including the nail folds. While the sub-millisecond pulse weakens the structure of the fungus, the heat produced by the light eliminates it. ∗The innovative technology of this laser allows for faster treatment of nail fungus. During the treatment 5 laser passes are applied per nail. In most cases, the treatment takes only one session. Is this treatment more effective than antifungals or topical treatments? ∗Studies have shown the Nordlys Nd:YAG laser to be more effective than topical solutions and at least as effective as antifungals. However, unlike antifungals, the laser treatment does not require a long-term commitment.